(27) Well, younger brother you should be attentive to the matter of Hare. "Well, grandmother, someone must come to the aid of my uncles and aunts. And, grandmother, I will be going for arrows." And in the morning there he went to a place for them. At this place was a big group of women. (29) "Nikaté! a fawn is nearby, let's kill it." They did kill it. "Niká! it is heavy. Well, let's fix it. Niká! let's do it." Then they fixed it. They said to one another, "Ho, this is lean meat. Whenever our dear nephew is the one to carry something to grandmother, my sister-in-law, he steals something. Grandmother has told you to give back the scaled fish to me." (31) He put on something and sat down. Grandmother strew some ashes around. He sat down. He was sick. These women came, the old women from whom the nephew (or grandson) had once stolen some big, thick ones. They said, "Waną! our nephew is sick. Niká! let's give him some big ones." (33) They grabbed a great many of the big ones. They started back. Ho, when they went home, he got up. Thus they did, and they took the food with them. Grandmother thought it was a good thing. Commentary. "younger brother" — The first sentence refers to a younger brother to whom the cycle is being told. "nephew" — the Hočąk is hičųšge, which can also mean "grandson." These women are Grandmother's sisters-in-law, therefore they are married to her brothers. To her brothers Hare would indeed be a nephew. "strew some ashes around" — it is said that this is done for his sickness. However, it is a well known tenant that ghosts are averse to ashes. The tacit suggestion may be that the sickness is caused by ghosts; on the other hand, it may be a precaution against his dying, that is, being carried away by the ghosts. As we see below, it is from ghosts that he has been stealing the fish. "he got up" — he seems to have been cured, if he was sick at all, as the vigor of his subsequent activities prove. What seems to be making him (fain) ill(ness) is the theft, just as what is curing him is the victims giving him of the sort of thing that he had stolen. "little uncles" — The Hočąk is hitégeniñk, with niñk meaning "little" and hiték being the usual term for the mother's brother. However, hitégeniñk can also mean "cousin," as cousins in this Crow-Omaha kinship system are also known as "little uncles." However, in the Hare Cycle proper, reference is always made to "aunts and uncles," inasmuch as Hare was born parthenogenetically from a human mother, making humans, who are the sisters and brothers of his mother, his aunts and uncles. Right at the beginning Hare speaks of his "uncles and little aunts." So "little uncles" should probably be taken literally. Clearly, "little uncles" refers to the fish that Hare has supposedly stolen. "give them back" — the assumption is that he has once again stolen fish from the old women. However, we are now told that ghosts (wanąǧi) are coming. This makes the strewing of ashes seem more appropriate. It also suggests that the ghosts just are the women from whom he has been habitually stealing fish. Indeed, the ghosts claim that he has done just that. Yet we know that Hare has speared the fish all by himself. Therefore, the fish must be in some way owned by the ghosts. The fish have been described as his "little uncles" (see above), as if they were human beings, or at least brothers of Grandmother. The old women from whom Hare has been "stealing" say they are sisters-in-law to Grandmother, which strongly suggests that the fish are a form that their husbands take. "koté, it is so" — that these are the old women is here contraindicated, since Lipkind says that koté is an exclamation used only by men. However, this can be explained away, since post-menopausal women as said to be "just the same as men." "they made food" — apparently, the two ghosts simply materialized some fish for him. They clearly have command over fish. In what sense, then, did Hare steal the fish? When he speared them alone, there is no doubt that he was not stealing them in the conventional sense. Yet the fish spiritually belong to the ghosts. Apparently, what has happened is that Hare has forgotten to perform the rite of propitiation of the souls of the fish by which true consent is ratified. All hunted animals have volunteered to give themselves up as food, but each is entitled to an offering of tobacco. If this is not offered, it is fair to conclude that the food, which is the body of the spirit who granted it, has not been properly appropriated, and is therefore stolen from the spirits who rule over that form of life. "I will not do it a second time" — apparently what is required is an offering of tobacco to the appropriate spirits, in this case, it seems to be ghosts. If this is not made, then it is stealing. This makes it clear that at least some fish are thought by some American cultures to be the souls of the dead. Links: Hare, Earth, Ghosts, Fish Spirits. Links within the Russell Hare Cycle: §2. Hare Gets Swallowed. Stories: featuring Hare as a character: The Hare Cycle, Medicine Rite Foundation Myth, The Necessity for Death, The Mission of the Five Sons of Earthmaker, Hare Acquires His Arrows, Hare Retrieves a Stolen Scalp, Hare Recruits Game Animals for Humans, Hare Kills Wildcat, The Messengers of Hare, Hare Secures the Creation Lodge, Hare Kills Flint, Hare Kills Sharp Elbow, Hare Visits His Grandfather Bear, Grandmother Packs the Bear Meat, Hare Visits the Bodiless Heads, Hare Visits the Blind Men, Hare Kills a Man with a Cane, Hare Burns His Buttocks, Hare Gets Swallowed, The Hill that Devoured Men and Animals, Hare Establishes Bear Hunting, Grandmother's Gifts, Hare and the Grasshoppers, The Spirit of Gambling, The Red Man, Maize Origin Myth, The Animal who would Eat Men, The Gift of Shooting, Hare and the Dangerous Frog, Thunder Cloud is Blessed, The Coughing Up of the Black Hawks, The Animal Spirit Aids of the Medicine Rite, The Petition to Earthmaker; featuring Grandmother Earth as a character: Medicine Rite Foundation Myth, Maize Origin Myth, Grandmother Packs the Bear Meat, Grandmother's Gifts, Owl Goes Hunting, Hare and the Grasshoppers, Hare Acquires His Arrows, The Plant Blessing of Earth, The Stench-Earth Medicine Origin Myth, Hare Visits the Blind Men, Hare Visits His Grandfather Bear, Hare Visits the Bodiless Heads, Hare Burns His Buttocks, Hare Gets Swallowed, Hare Kills Wildcat, Hare and the Dangerous Frog, Hare Retrieves a Stolen Scalp, Hare Recruits Game Animals for Humans, The Necessity for Death, Hare Secures the Creation Lodge, Hare Kills Sharp Elbow, Hare Kills Flint, The Gift of Shooting, The Creation of the World, The Creation of Man (vv 4, 6), Hare Establishes Bear Hunting, Redhorn's Father (? ); mentioning ghosts: The Journey to Spiritland, The Four Slumbers Origin Myth, The Resurrection of the Chief's Daughter, Holy One and His Brother, Worúxega, Little Human Head, Little Fox and the Ghost, Pete Dupeé and the Ghosts, The Lame Friend, Ghost Dance Origin Myth I, Ghost Dance Origin Myth II, The Difficult Blessing, A Man's Revenge, Thunder Cloud is Blessed, Two Roads to Spiritland, Sunset Point. Themes: ghosts are averse to ashes: Ghost Dance Origins II, Pete Dupeé and the Ghosts. 1 Jacob Russell, Stories from the Hare Cycle, in Paul Radin, Winnebago Notebooks, Winnebago III, #14, Freeman #3893 (Philadelphia: American Philosophical Society, n.d.) 27-41. Phonetic text only. 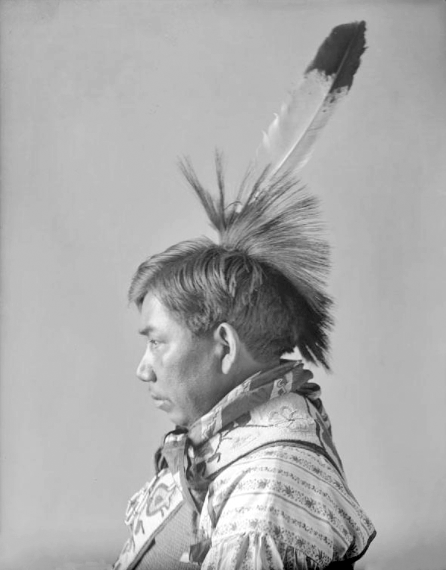 2 Åke Hultkrantz, The Religions of the American Indians, trs. Monica Setterwall (Berkeley: University of California Press, 1979 ) 133; Åke Hultkrantz, The North American Indian Orpheus Tradition, in Statens Etnografiska Museum, Monograph Series 2 (Stockholm, the Museum, 1957): 69ff.